On behalf of the Taber Community Garden group, I wish to express sincere and grateful thanks to the staff and board of the Taber Christian School for providing space on their school grounds for the last seven years as a home for our garden. Always, were they respectful and supportive of our efforts to provide fresh produce, not only for ourselves but for needy members of our community. We felt they appreciated the beauty and productivity of the garden. Because of the great increase in students attending the school and the need to provide safer loading and unloading of students being transported by a resultant increase in buses and bus service, it was necessary for the school to use the garden area. We support and accept their decision. After all, student safety is more important than even our beloved garden. However, the garden is not lost. Sid Tams, several years ago in the development of Prairie Lakes, provided a community garden spot for residents in Taber and area. He built it up with top soil and compost so we were able to move over there this spring. 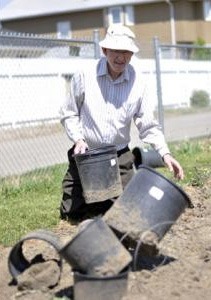 His generosity and commitment to Taber beautification is becoming well known around town. We are one of the fortunate beneficiaries of his big heart. Thanks, Sid. We will make this a beautiful, productive and hopefully delightful respite for others. Drop around this summer and fall for a visual tour.